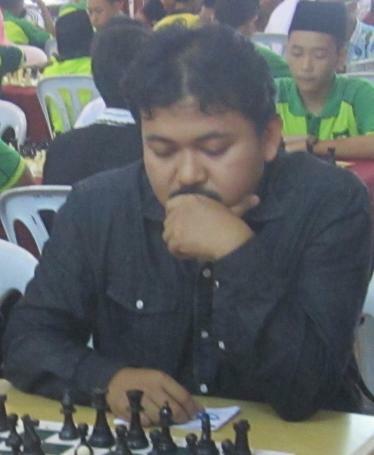 Asian Master (AM) Fadzil Nayan (below picture) won another rapid chess tournament this year. He beat more than one hundred chess players in the Insofar combined rapid chess tournament held yesterday at DATCC. Two weeks ago he became the champion in a rapid chess tourney in Kuala Kangsar. 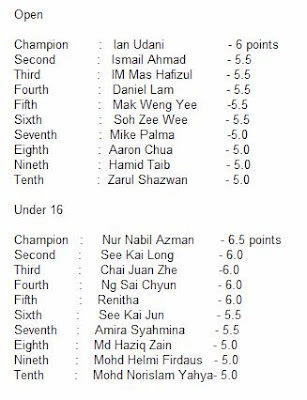 AM Fadzil scored 6.5/7 points from six wins and a draw. Syabas and tahniah to him! Did you notice the name at the tenth rank in the above Top 20 Final Ranking? 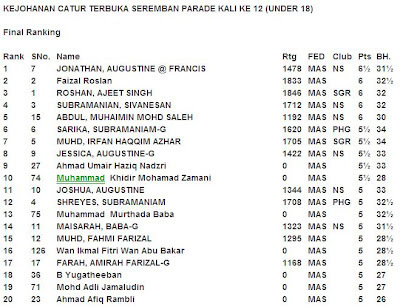 On Saturday, he became the first runner up in the 12th Seremban Parade U18 age group. The children of GiLoCatur did not take part in any of the chess tourneys during the weekend. 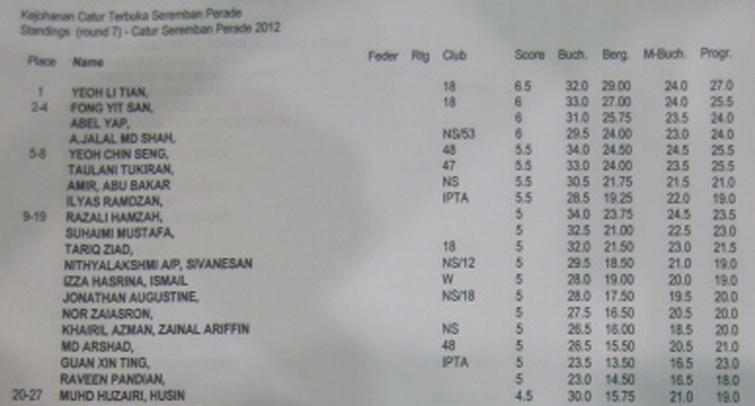 One of the tourneys was the 12th Seremban Parade broken up into three different categories. Both the Under 12 and Under 18 categories were held on Saturday while the Open section was held on Sunday. Who was the champion for the Under 12 category? 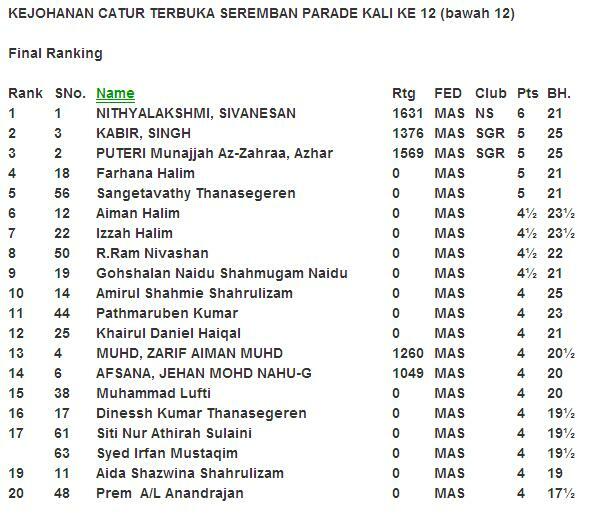 Negeri Sembilan MSSM state player, Nithyalakshmi Sivanesan, emerged as the champion after scoring 6 points. GiLoCatur believes only six rounds played for the category. The other winners familiar to GiLoCatur are the first runner up, Kabir Singh from Petaling Jaya, Puteri Munajjah from Jenjarom and the Halim siblings - Farhana, Aiman & Izzah, from Johor. How about the Under 18 category? Who won this category? The local boy named Jonathan Augustine, a rising player, became the champion after edging several strong players. 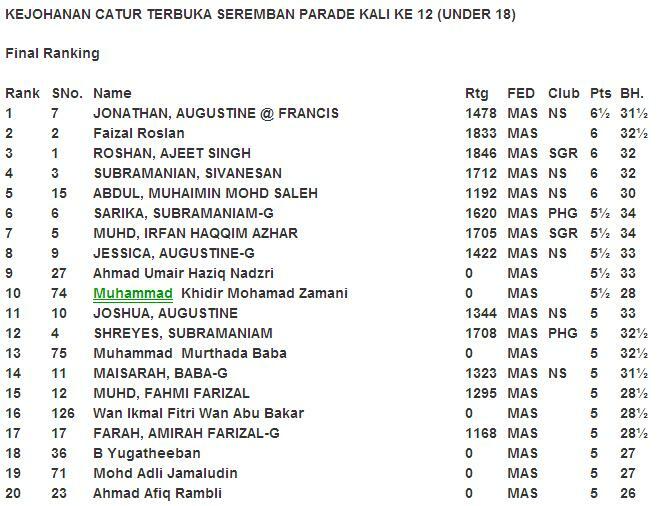 Among the strong players are two of Selangor MSSM L15 state players - Roshan Singh and Muhd Irfan Haqqim Azhar, KL MSSM L15 player, Faizal Roslan, Pahang MSSM L15 state player, Shreyes Subramaniam and Negeri Sembilan MSSM L15 state player, Subramanian Sivanesan. It is obvious that most of the participants are warming up for the MSS chess championship. In the Open category, about one hundred participants took part. 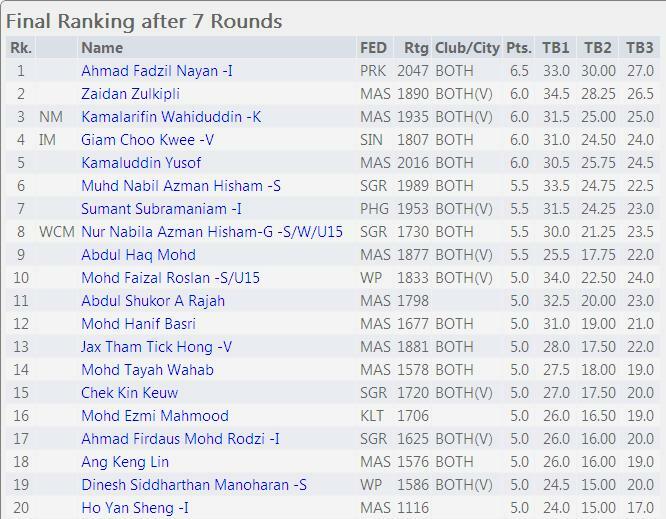 One of them is GiLoCatur's chess buddy, Razali Hamzah aka Ng6. GiLoCatur would like to congratulate him for being the top 10 in the final ranking. The current Malaysian top junior, Yeoh Li Tian, came with his father to the tournament and became the champion after scoring 6.5/7 points. Please go to Ng6 chess blog here to view his photo galleries on the tournament. Surely, GiLoCatur really missed to come to the tournament. GiLoCatur and the kids did not take part in any chess tournament last weekend. Neither this weekend. This weekend, GiLoCatur will be busy attending PTA or PIBG meetings. 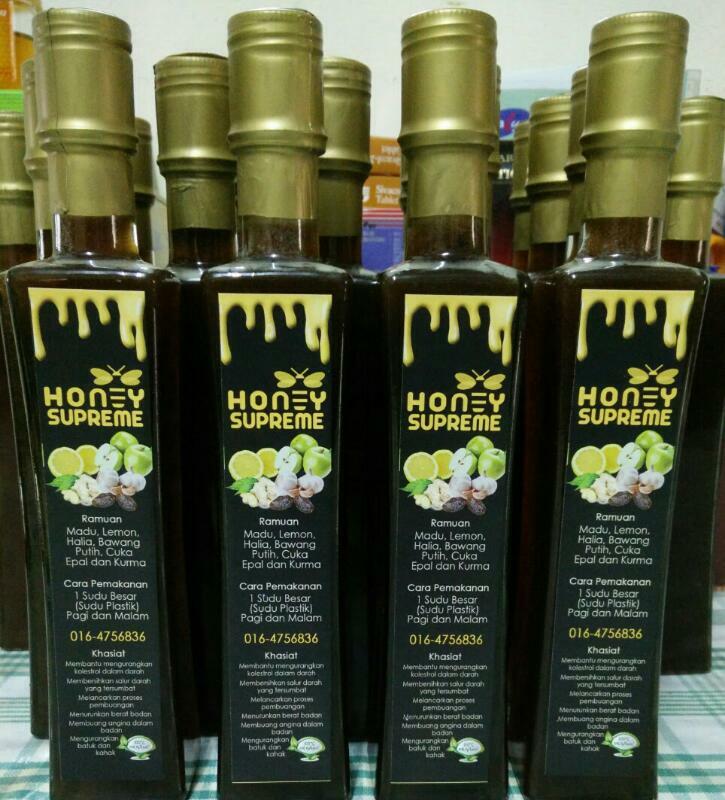 On Saturday will be at SKBJ and on Sunday will be in Kuala Selangor. So, only one tournament in this month. Last month also only one tournament. Mmmm not so active in the beginning of new 2012 year, eh. Last weekend, one tournament each in Perak, Terengganu and Johor. Only the tournament in Terengganu being covered in one of the local chess blogs. The full result was also published online in the chess-results.com. No news at all about the tournament in Perak. The same goes to the tournament in Johor. Isn't it a wish list for every member of Malaysian chess community to have all the local chess tournaments being covered and published online? 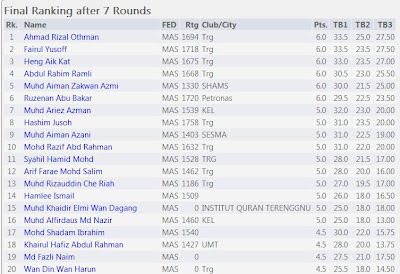 GiLoCatur feels guilty for not being able to put up the winners list for the 12th Bandaraya JB Chessmasters even though got it a day after the tournament via chess-malaysia yahoo group. But what to do. GiLoCatur has been very busy at work. Enough with that. 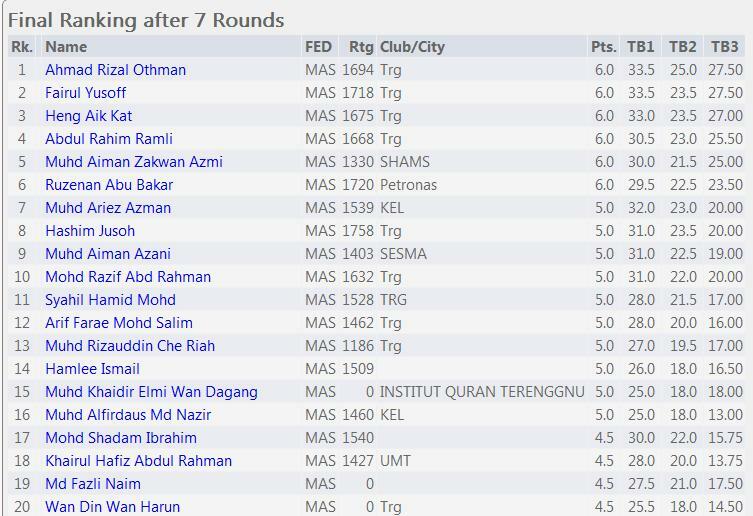 Let's look the final ranking of the chess tournaments in Terengganu and Johor. The MSN City Night Games is the name of the tournament for the event in Terengganu. GiLoCatur wonders why it is named like that, having "Night", since the event is held in daytime. It had attracted about 80 participants in the Open section and more than 20 players in Under 12 category. Amazingly, six players had the same 6/7 score including the champion. Ahmad Rizal Othman had been declared the champion in the Open category after having the highest and best tie break. He succumbed to a defeat to Ruzenan Abu Bakar in the final round after having a winning streak of six rounds. No result for the Under 12 category due technical issue resulted from the electricity being cut down due to heavy rain. What a challenge for all the participants to being caught in such natural disaster. GiLoCatur salutes to all of them. How about in Johor Bahru? How many players took part in the tournament? Who became the champion? Malaysian-based Filipino, Ian Udani, managed to pip the Malaysian top player, IM Mas, to emerge as the champion. He scored 6 points. Amazingly also, five players shared 5.5 points. Former World Police Champion, Ismail Ahmad, won the first runner up. While IM Mas won the second runner up. In the Under 16 category, WCM Nur Nabila came all the way from Selangor to emerge as the champion. She scored 6.5 points. 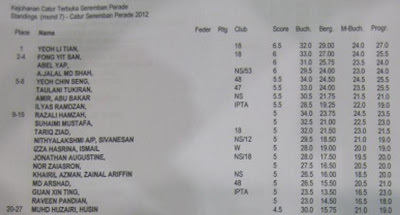 Another winner from Selangor is Amira Syahmina who won 7th place. GiLoCatur noticed that among the winners is a player who hails from Kedah. Congratulation to all the winners! Keep supporting chess in Malaysia. 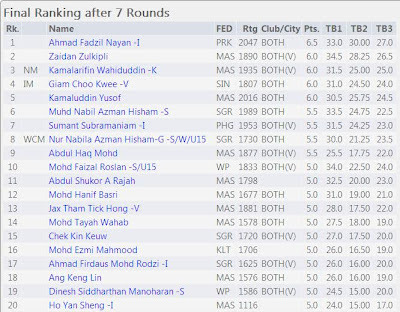 Good news to the Malaysian chess fraternity! Mr Eddy Fong (in white shirt, above picture) is going to organize a chess tourney. 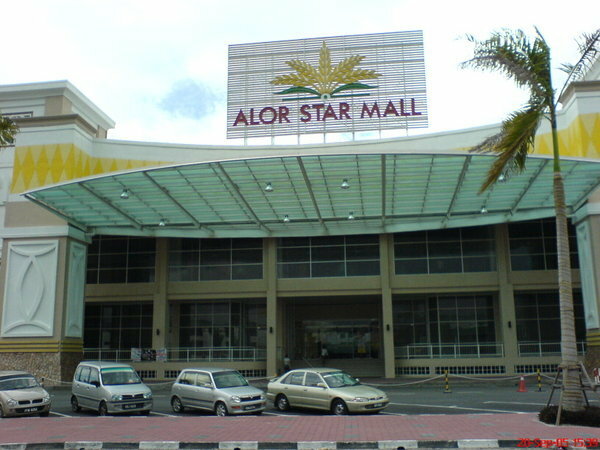 The tourney, however, will not be held in his hometown (GiLoCatur's assumption) Kampar, Perak. Instead, it will be held at DATCC in Kuala Lumpur. A bit info on Mr Eddy Fong. He is the father of the 2010 Malaysian Women National Master, Mi Yen. His other children who are very familiar in the local chess competitions are Yit Ho and Yit San. GiLoCatur just noticed that Mr Eddy Fong had a blog on first Malaysia GM since 2006. He wrote and made a coverage on the Malaysian teams - both Men and Women, in the 2006 Turin Chess Olympiads. When his chess tournament will be held? The tourney is scheduled on 17th and 18th March 2012, about a month from now. So, MARK YOUR CALENDAR! There are four chess tournaments as GiLoCatur aware during the 16th to 18th March weekend - Kedah Closed, 18th USM Team event, 11th Klang Parade and New Nagas Standard Chess tournament. Another good news is the tournament will be a nationally-rated event. Surely you want to know the details of the tournament, right? Click here to read further details on the tournament or go to this link to download the registration form. Good luck and syabas to Mr Eddy Fong. Hope he will become an active chess organizer for the best sake of the Malaysian chess community. Are you a KEDAHan? Are you born in the "JELAPANG PADI" state? 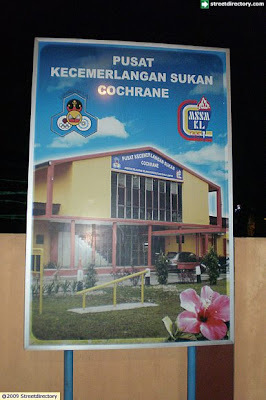 Are you schooling in Kedah? Are you working in the state? Are you a Kedah resident? If the answer is YES and you are a chess player, there will be a chess tournament for you to take part. It is Kedah Chess Closed or in Malay, Kejohanan Catur Tertutup Kedah. The tournament will be held for two days in mid March about one month from now. The time control is 45 minutes per player, the most ideal time control for GiLoCatur. Three rounds on the first day and the other four on the second day. Where the tournament will be held? How much is the fees? How to register? When is the closing date? The answers to these questions can be found in Syedchess' chess blog here. "WEY, ORANG KEDAH SEMUA. HANGPA TAK BERANI KA MAI MENYAHUT CABARAN? AWAT HANG TAKUT? TAKDAK TEL** KA? PI DAFTAR LEKAIH, 80 ORANG PESERTA SAHAJA! PI CONTACT SYEDCHESS TU!" Which Chess Tournament GiLoCatur and the Family Went? GiLoCatur, wife and Fahim arrived home at around 1.00 am. 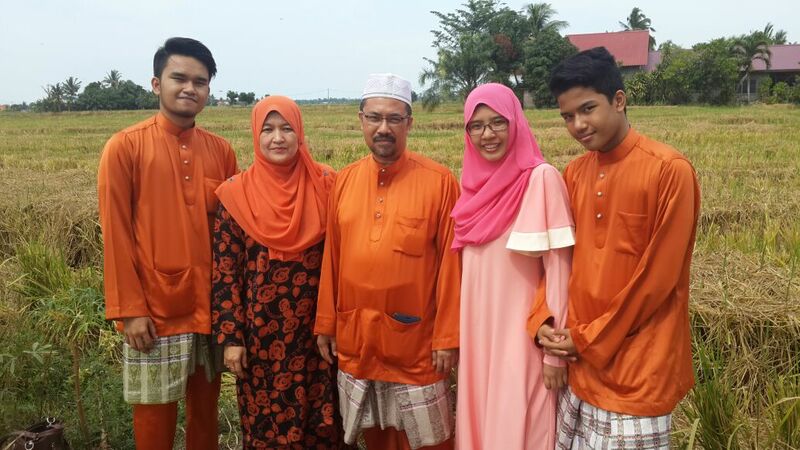 GiLoCatur and family left home in Shah Alam after Subuh prayer to the tournament venue located about 240 kilometers north. 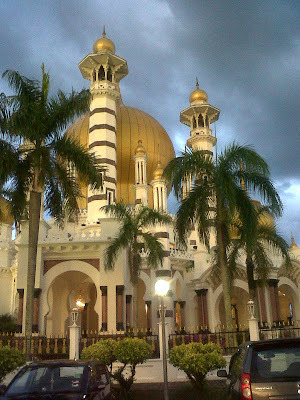 After the tournament, GiLoCatur and the family managed to pray in the gorgeously beautiful Masjid Ubudiah or Ubudiah mosque (below picture) situated on Chandan Hill. After the maghrib prayer at Ubudiah mosque, on the way back home before entering the north-south highway, GiLoCatur and the family stopped at Laksa Pak Ngah cafe to taste the popular laksa since two years before the Malaysian Independence in 1957. 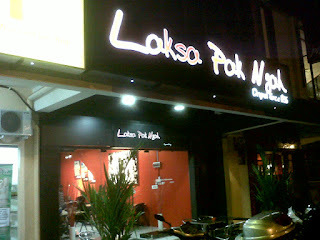 For readers and visitors who are not familiar what laksa is, go to this link to find out. Going To SMK Clifford OR the Cochrane Excellence Sports Center? Where would GiLoCatur and the kids be on Sunday this weekend? We have TWO choices. 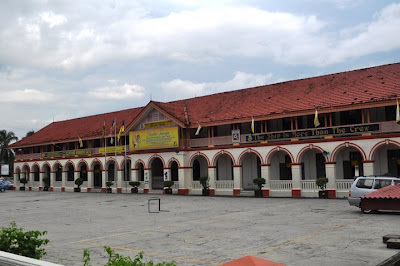 It is either going to SMK Clifford situated in Kuala Kangsar, the Perak Royal town or Cochrane Excellence Sports Center in KL. At both locations will be held rapid (G/25) chess tournaments. SMK Clifford established in 1897 will be the venue for the first leg of the third Tan Sri Lee Loy Seng Perak Grand Prix chess championship. Participants will have to play 7 rounds of 25-minute-per-player chess match. Meanwhile, the Cochrane Excellence Sports Center will be the venue for the PERCAWI City Day Age Group chess tournament. Only six rounds will be played. Do you want to know what it is gonna be? Come back again to find out! Actually, GiLoCatur had not realized that GiLoCatur has been crazy about chess since childhood. Even though GiLoCatur did not play in many tournaments during the school days due to many reasons, GiLoCatur did play with friends then. 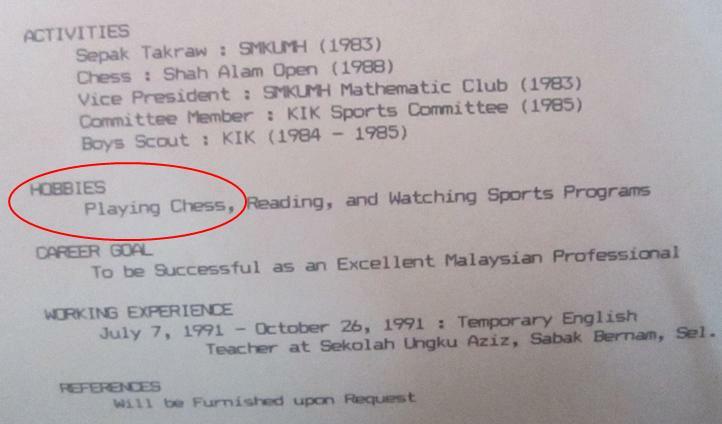 While in the primary school in Sabak Bernam, GiLoCatur represented the school in the MSS District chess competition for two consecutive years - 1979 and 1980. Unfortunately, GiLoCatur did not win to represent Sabak Bernam District to the state chess championship. One of GiLoCatur's schoolmates managed to win but she did not go. Transportation was the main problem during those days. Not many parents had car during that time. Unfortunately, there was no digital camera or even a normal camera photo to show GiLoCatur's kids. Unlike their participation in chess tournaments, all can be and are recorded digitally. Lucky them. Yesterday, while doing housekeeping GiLoCatur found the following evidences about the passion for chess. GiLoCatur took part in a chess tournament organized by the Selangpr Public Library or its Malay abbreviation, PPAS. GiLoCatur was 20 years old at that time and was studying at a preparatory study college in Shah Alam. But GiLoCatur has no answer to why GiLoCatur never took part in any chess tournament while studying in El Paso, Texas for two and a half years. Back home in mid 1991, GiLoCatur did take part in few chess tournaments held in KL especially underground of Dataran Merdeka. 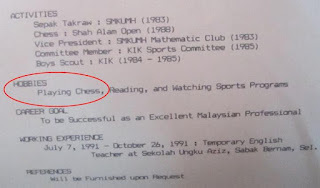 GiLoCatur included playing chess as one of the hobbies in the resume. GiLoCatur is doing the best so that the kids can have the opportunity to go farthest as possible in chess. GiLoCatur also try the best possible to document and record their journey in chess. GiLoCatur hopes they will not waste the continuous support and sacrifice given to them. Not many Malaysian parents are willing to do so. So, my dearest chlidren - FIKRI, ANIS FARIHA and FAHIM AL-FAQEH, keep on your chess journey. It is 20 minutes to 2.00 am now. At the moment Round 2 play off of Gibraltar 2012 is on going between sensational Hou Yifan and Nigel Short. GM Short just won the first play off. The playoff is to determine the first prize. Yifan, the reigning Women's World Champion, is so sensational in this tournament. She beats GM Judit Polgar, the female all time best player in the 7th round. After that, she won against GM Le Quang Liem, another 2700-club players. Well done to Hou Yifan. Her feat in the Gibraltar 2012, even if she lost in the playoff, should be inspirational to all the Malaysian women chess players including GiLoCatur's only daughter, Anis Fariha.